Trooping the Colour reviewed by His Royal Highness The Duke of York is identical to Trooping the Colour reviewed by Her Majesty The Queen, with the exception of some additional mounted officers who ride when Her Majesty The Queen is present. Trooping the Colour reviewed by His Royal Highness The Duke of York also includes over 240 soldiers from the 1st Battalion Welsh Guards who will line the route down The Mall. Taking part will be up to 1450 soldiers of the Household Division and The King's Troop Royal Horse Artillery, along with up to 400 musicians from the Massed Bands, all of whom will parade on Horse Guards for the second of two formal Reviews. The soldiers will be inspected by His Royal Highness The Duke of York, Colonel Grenadier Guards. Members of the public can watch from the stands on Horse Guards Parade by applying for tickets. Alternatively, a limited view can be obtained by standing on The Mall or on the edge of St James's Park overlooking Horse Guards (the view may be somewhat obscured by troops in this position) from 9.00am. These public vantage points are indicated on the map with black dotted lines. The Parade begins at Horse Guards at 10.00am and will finish by 12.25pm. Trooping the Colour reviewed by The Major General and Trooping the Colour reviewed by HRH The Duke of York have a restriction on the number of tickets purchased to no more than 100 per application; if a group requires more, please contact us. Wheelchair tickets are limited to a maximum of 2 per booking. Each wheelchair ticket includes a space for a wheelchair and a seat for a companion. For Trooping the Colour reviewed by HM The Queen, tickets for seated stands around Horse Guards Parade are allocated by ballot. Up to a maximum of 4 tickets can be applied for. Successful ballots will be notified by 31st March 2019. Unfortunately, if you are not successful in the ballot you will not receive an email. Please note: there is no group purchase of tickets for multiple events. Tickets for each event must be purchased separately. The nearest Railway Stations are Charing Cross, Waterloo and Victoria. The nearest Tube Stations are Westminster, Embankment, Charing Cross, St James’s Park and Victoria. 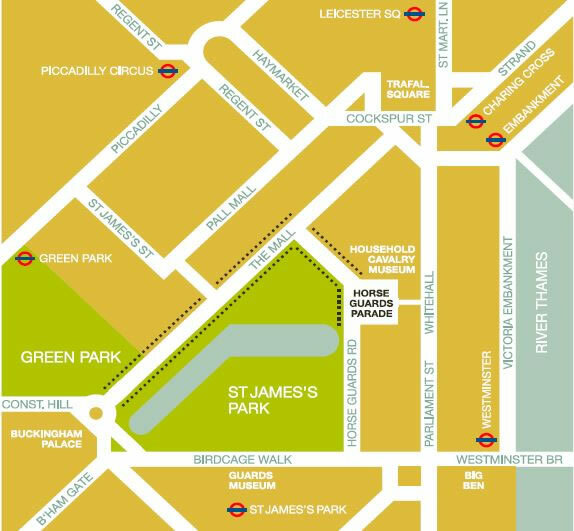 Access to Whitehall will be via Parliament Square. On arrival at the junction of Parliament Square and Parliament Street, please have your tickets ready for checking by the Metropolitan Police and Household Division soldiers. Vehicles will be allowed to drop off at Horse Guards entrance but not to park. All vehicles will then be directed to leave Whitehall via Horse Guards Avenue. - Seated Stands A, B, C and Standing Inner Line of Sentries North - via The Mall, Horse Guards Road (north) and Admiralty Citadel. - Seated Stands D, E, F, G, Wheelchair (Special Enclosure North) and Special Enclosure South – via Whitehall and Horse Guards Arch. - Seated Stands H and J - via Downing Street and Treasury Passage (for the first two parades only). On the day of the third (last) parade please use the same directions as given for stands K-N below. - Seated Stands K, L, M, N and Standing Inner of Sentries South - via Birdcage Walk/Great George Street and Horse Guards Road (south) and Churchill War Rooms. Limited toilet facilities are available between stands C and D and G and H.
Please check the map provided on your ticket to view the entrance points for each Stand/enclosure. You must use the entry point for your stand. If you try to use a different entry point, you will be re-directed to the correct one which will involve more walking and take more time. Please arrive in good time (minimum of 50 minutes in advance) to allow for security searches. Children over the age of 2 cannot be admitted without a ticket. This is a formal military parade and those attending are encouraged to look smart. Lounge suit or jacket, tie and trousers; equivalent for ladies (no denim, shorts or sandals). Serving Military personnel may wear Ceremonial Day uniform (with medals) or equivalent. NON COMPLIANCE WITH THE DRESS CODE WILL RESULT IN REFUSAL OF ENTRY. Hats are optional but are recommended for paying the necessary compliments to His Royal Highness The Duke of York and the Colours as they pass, as well as giving the necessary protection from the sun. Umbrellas/parasols are not permitted to avoid obstructing views. Please also consider bringing a coat as the Stands are not covered and the weather can change during the course of the Parade. This website only uses common tracking, and we don't track or share personal details about you. What is tracking? Like most websites we do need to use a couple of cookies for our website to function and to know if you for example have signed in or not. You can’t turn these cookies off, but they are not used for tracking and are automatically deleted when you close your browser. You can read more about tracking and how we handle personal information on our Ts&Cs page.